From left to right: Allan Wasel, Hollyburn General Manager; Paul Sander, Hollyburn Director; MLA Jane Thornthwaite, North Vancouver-Seymour; Councillor Holly Back, City of North Vancouver, representing Mayor Mussatto; Karen Rahal, Property Manager, Concert; David Hutniak, CEO, LandlordBC, Shona Athey, Member Services Representative, LandlordBC. NORTH VANCOUVER, B.C. 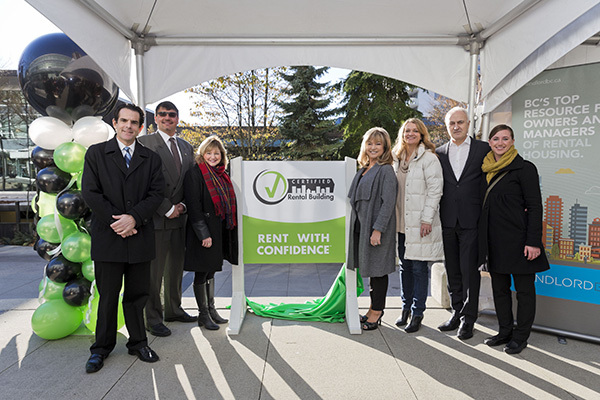 (November 26, 2015) – LandlordBC, the province’s largest landlord professional industry association, is pleased to announce the launch of the Certified Rental Building program in British Columbia. A quality assurance program designed to assist renters to easily identify well-run, well-managed rental properties. For a property to be designated as a Certified Rental Building, it must meet mandatory requirements in five key areas. These requirements address standards relating to resident management, human rights compliance, building operations, financial management and insurance, energy conservation and sustainability. For rental housing providers the benefits of the CRB program are also significant. Not only will they have better run buildings and happier renters, but the program will also help landlords grow their business and have a better, more professional relationship with renters and their own employees alike. This designation means the rental property management companies and staff have demonstrated compliance with 50 Standards of Practice including training and education programs. A building that is certified with CRB will have undergone a third party audit by J.D. Power and Associates to ensure that the building and company staff are adhering to legislative requirements and are providing a quality product and quality service. Similar to a star rating in hotels the CRB checkmark can provide existing and prospective tenants with peace of mind when selecting a place to live. Concert Properties and Hollyburn Properties are the first LandlordBC members to sign onto the Certified Rental Building Program. As two of the largest rental properties owners in the province, the involvement of these two companies provides an excellent start to the program in B.C. LandlordBC expects many more rental property owners to also join the Certified Rental Building Program over the coming months. The Certified Rental Building Program is North America’s first and only quality assurance certification program for multi-unit residential apartment buildings. The goal of the program is to promote professionalism in the rental housing industry while providing tenants with a quality assurance alternative when selecting a rental apartment home. Since first being launched in Ontario in 2008, 40 per cent of the province’s multi unit residential buildings have become certified. The goal for British Columbia is to achieve even greater outcomes within the next decade. LandlordBC is the largest landlord professional industry association in BC. LandlordBC has more than 3,300 members who own all forms of rental housing, from high-rise buildings, to investment condos, to secondary suites. Members of LandlordBC have access to education, advocacy, group programs, proprietary tenancy forms, online tools to manage and market properties, networking opportunities and operational advice.